During the run up the to exams I was blogging about the lack of a good textbook when it came to a couple of subjects and how this meant we had numerous resources to refer to in an open book exam. I questioned whether self made notes could replace the textbook and toyed with the idea of designing my own textbook, but was initially worried I wouldn’t have the time so late in the game. Challenged by the idea of completing such a task I wrote my own text book for both my Commercial Law and Commercial Property Law which I felt were the 2 subjects with the weaker notes. If I was doing the LPC over again I would probably try and do this for all the subjects since I obtained over 80% for both these subjects. The notebook itself was a great choice although the downside that some people may find with it is that because it is case bound it is not easy to remove pages and may prefer a perforated book. However as a person who would yank out a page at the smallest mistake and start again, this notebook was good training for me – both to plan and be more careful, and also to make do and realise the book is for my private use and a simple crossing out won’t matter too much. Once you’ve made a decision on the notebook to use, next it is important to decide what to use it for and what you want to get out of the book and plan how you are going to achieve these aims. It cleared space on my desk and saved the time that I would have spent flicking through various resources – i.e. more writing time. By writing all the information in the book and organising it myself I KNEW the information much better and was more confident about the material. In addition I also had a much better idea of where to find it in the book. I moulded the book into a combination of the textbook notes, my notes and research and the tips and information given by the tutor. Therefore it was a much higher standard of information. 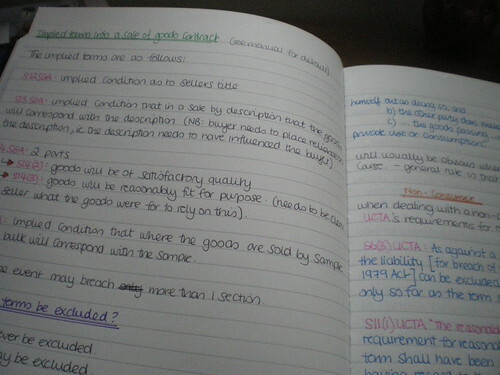 Using my commercial law notebook as an example I will show you how I put my book together. What will be best for each subject / individual will vary and I do suggest that you use whatever is most suitable – but hopefully this will give you some inspiration. On the Electives course, most of the material is taught in it’s own distinct workshop. 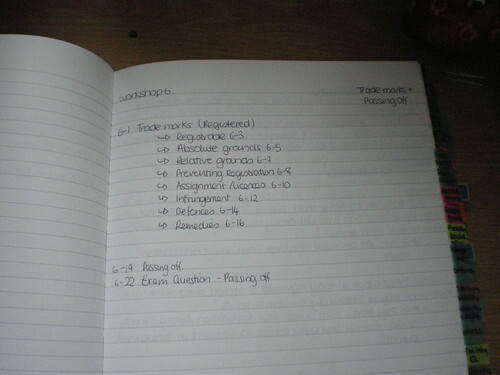 So I kept the “workshop” format which essentially became the 10 chapters of the book. The information was than broken down into a mixture of key information / bullet points, statutes and case law to back up the information and extra information to enable me to show a greater understanding and flesh out any exam answers. Another key thing to put in is the things that will help you in the exam: ways to structure your answers, things you always forget/get wrong, mistakes friends made in case you make them too and finally any other advice the tutor gives you. And finally try it out. Use the book to complete prep, tackle your mock exam etc – this helps you realise what extra things you need. I used my notebook in my mock exam and as a result I decided to number the contents page with page number and not just the title. It was great to spot things you might have previously overlooked. The contents are colour coded. I used different colours to distinguish the information. This can either be to make the information easily to understand, make the pages more atheistically pleasing or simply to aid a visual learner. The pages have two numbers: the first is the workshop / chapter number and then the second is the page number of that chapter. (nb. the contents page and index will list these numbers for easy reference). Tabbing. Tabbing doesn’t work for everyone. But the way I did this book was the same as I would have done any of my LPC textbooks. 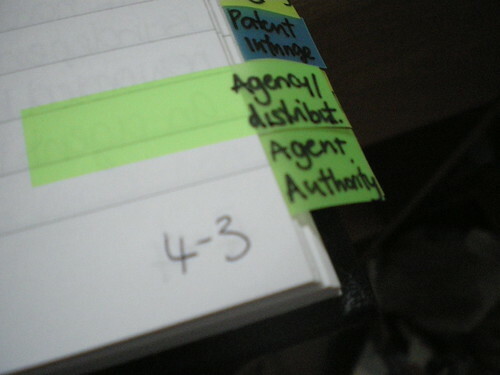 Different colours for different topics, in a running sequence. 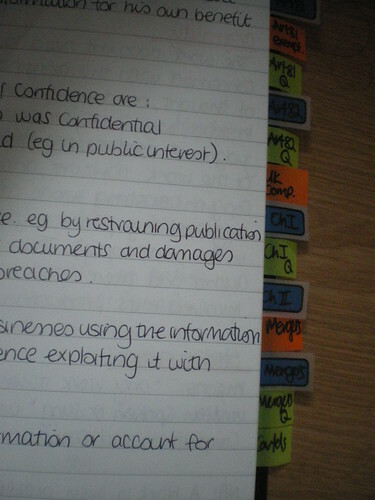 And then different style tabs to represent the key topics and exam hints. What you get out of your notebook, depends entirely what you put into it. It is an impressive learning tool and study aid as well as a resource. It helps your understanding of the subject matter to coherently put it down on paper without just copying from another textbook. If you are a visual or kinetic learner – this will be an excellent method to add to your revision techniques, only difference is it starts a little earlier than the usual revision.